Alcohol has been enjoyed by people for centuries, and is a time-honored and largely beloved part of human culture. Whether it’s a huge celebration or just a small gathering of family and friends, you can almost guarantee that some form of alcohol will be present. Hangover Heaven is based in Las Vegas, so we deal primarily with the aftermath of American drinking culture. With many tourists coming to visit Las Vegas from outside of the U.S., the drinking cultures and behaviors of other countries naturally peaked our interest. We found a number of diverse and authoritative sources on the subject, and clearly, there are some countries that love their alcohol a bit more than others. Check out our findings below – some of them may surprise you! First and foremost, we wanted to know which countries love to drink the most. 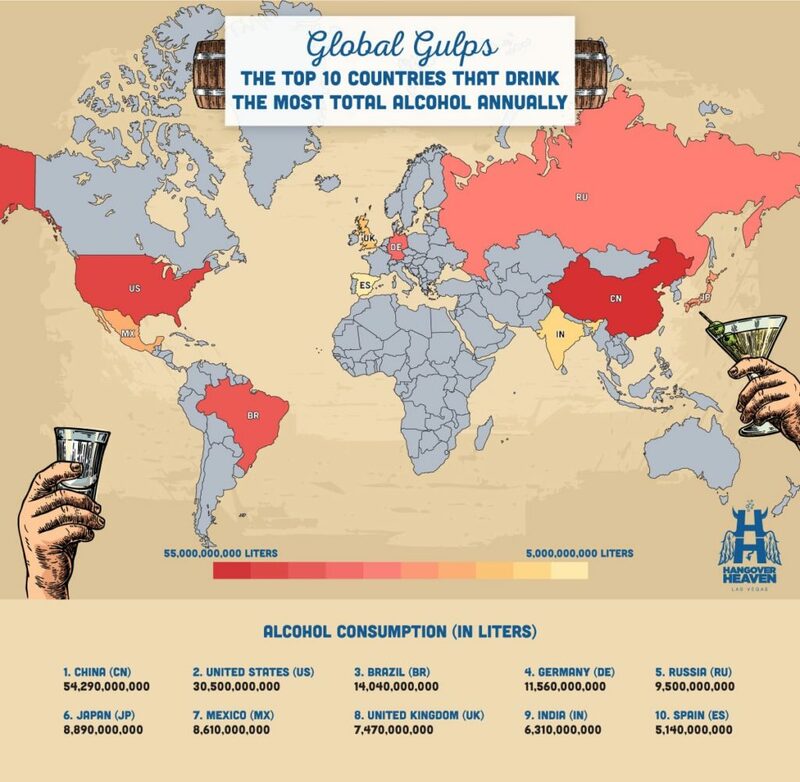 Using an industry report that details alcohol sales and consumption around the globe, we were able to compile the above map, which details the top ten countries that drink the most in terms of pure volume of liquid consumed. It is not terribly surprising that the country with the largest overall population, China, also downs the most alcohol, and does so by a wide margin. In fact, the United States only drinks half as many liters of alcohol as China does, and third-place Brazil is an astonishing 40 billion liters behind the Chinese pace. It is also worth noting that the world’s second-biggest country, India, also made the list, but its alcohol consumption only amounts to around 1/9th of China’s total. This proves that population size doesn’t guarantee a finish at the top of the list. When taking a deeper look at the kinds of alcohol that contribute to those consumption numbers, one drink stood out: Beer! 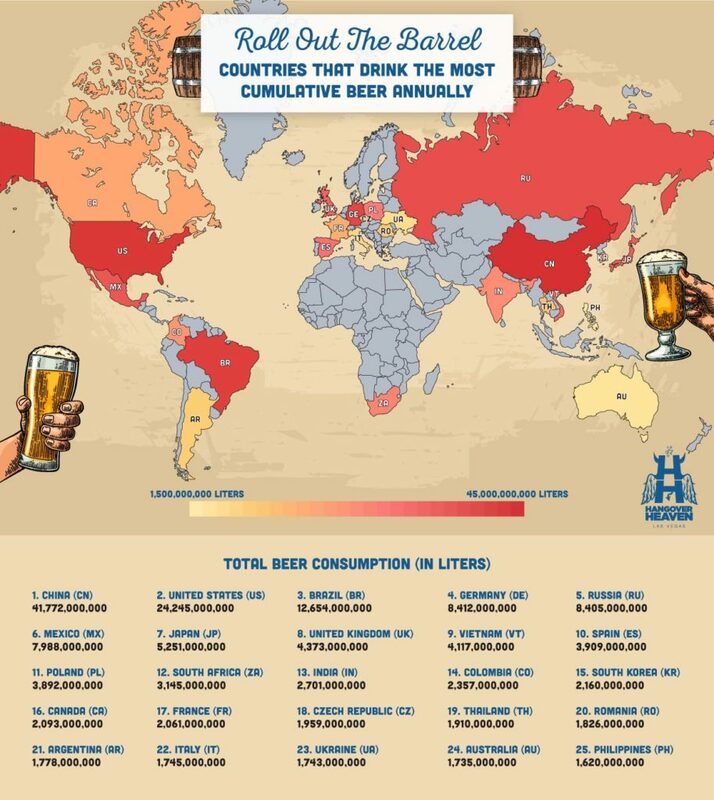 Given how massive the beer industry is around the globe we figured it would be the most popular type of alcohol on the planet going into this analysis, but we didn’t expect the numbers to be so skewed. Beer accounts for 77% of the total alcohol consumed in China and 80% of that total in the United States. 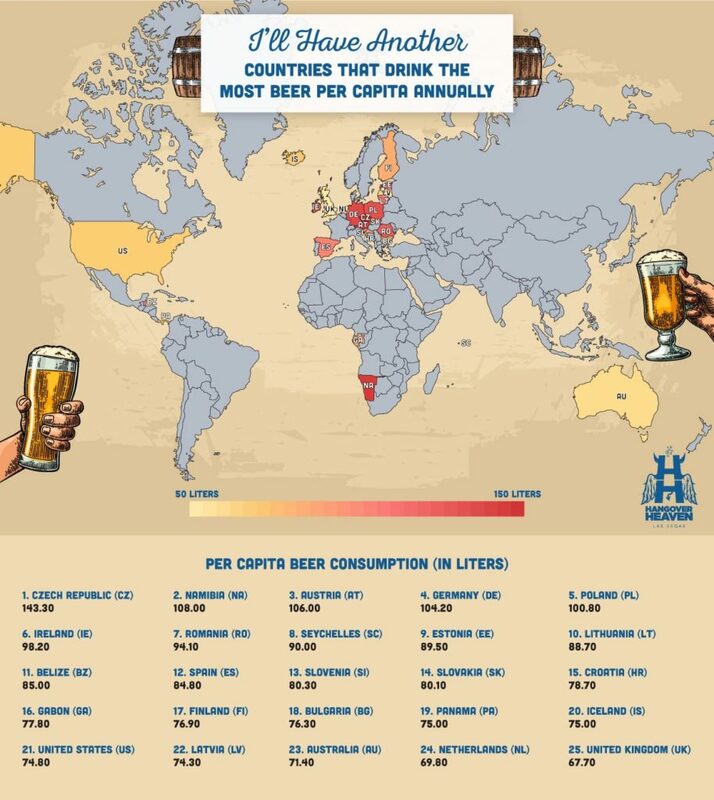 In fact, those two countries drink so much beer that their total consumption of the drink in liters is greater than the total in liters of ALL alcohol consumed in Brazil, Germany, Russia, Japan, Mexico, and the United Kingdom combined. 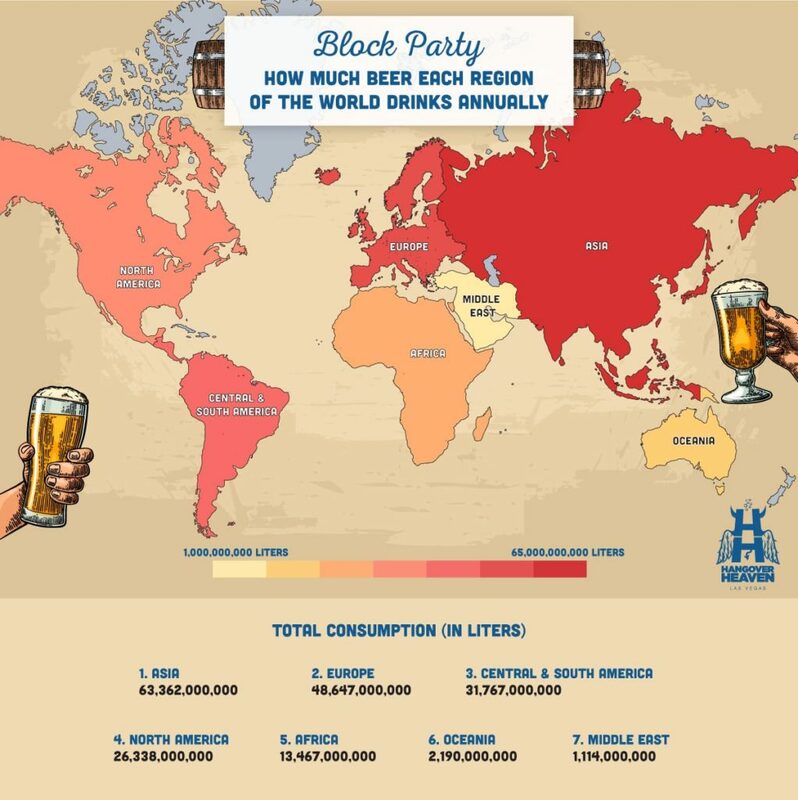 We were curious to find out which region of the world loves their beer the most. When looking at the total number of liters of beer consumed, Asia takes the top spot (mainly because of China’s hefty population), followed by Europe. Interestingly, the combined efforts of Central and South America puts that region ahead of North America. As we’ve noted, part of the reason for the chart-topping totals of countries like China in these cumulative evaluations is their large populations. With that in mind, we thought it would be interesting, and definitely more revealing, to look at how much beer is consumed per person around the world. Using the same global report that provided our previous beer-related insights, we found out which nations love their hops more than any other. 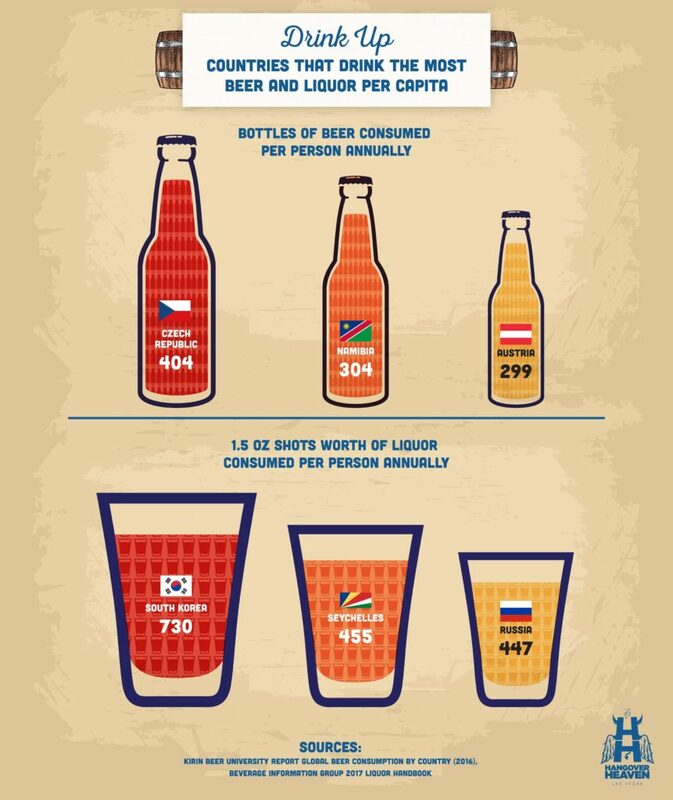 By this metric, it is the Czech Republic that finished first, as its per capita consumption is over 143 liters of beer annually. That total is remarkable when you consider that the next-highest total seen is Namibia, which consumes over 35 liters less per person in a year. Changing the evaluation to focus on per capita numbers revealed something else interesting – smaller countries drink much more per person than the larger nations leading the cumulative lists. 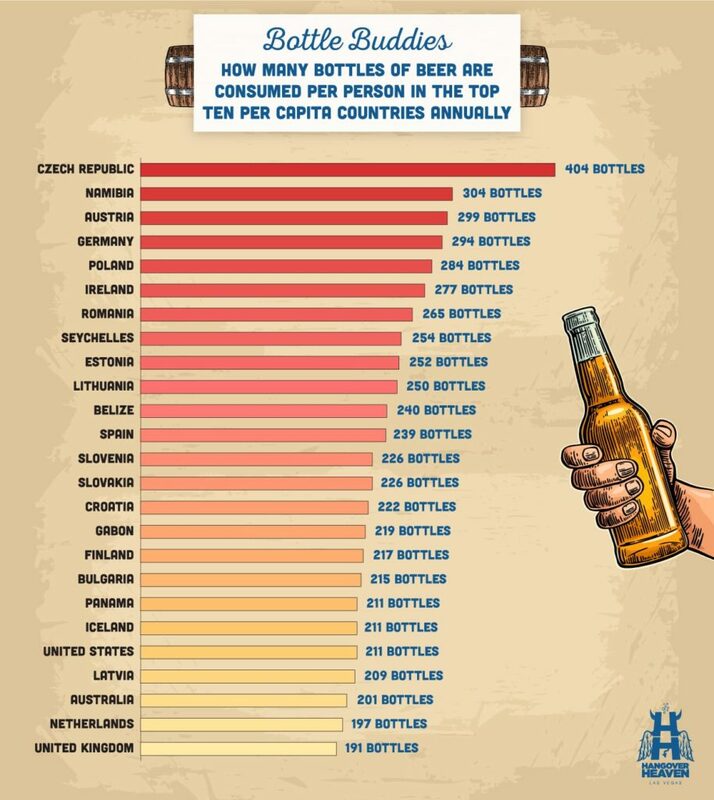 In fact, of the 10 countries that consume the most beer cumulatively every year only one, Germany, also finished in the top 10 per capita. Because looking at the consumption numbers in terms of pure liters may not be the easiest thing conceptualize, we converted those numbers into a more relatable metric: bottles of beer. This revealed that people in the Czech Republic average more than a bottle of beer every single day, with their citizens drinking the equivalent of 404 bottles a year, an even 100 MORE than second place. While beer may be the world’s most popular alcoholic beverage of choice, it is far from the only one available. From cocktails to shots, people around the world love to consume liquor drinks of all kinds. Whiskey, gin, tequila, and more are staples in bars in every corner of the globe. With that in mind, we found a source of data from within the liquor industry to evaluate per capita liquor and spirit consumption in different countries around the world, similar to how we looked at beer. Much like how the Czechs outpaced every other nation when it comes to drinking beer, we discovered that the soju-loving South Koreans consume over 33% more liquor than the citizens of any other country on the planet. Their total of 32.39 liters of liquor consumed annually outpaces countries with notable national drinks like Russia and vodka or Japan and sake. To put these totals into easier-to-understand terms, we converted the liter totals to their 750mL whiskey bottle equivalents. 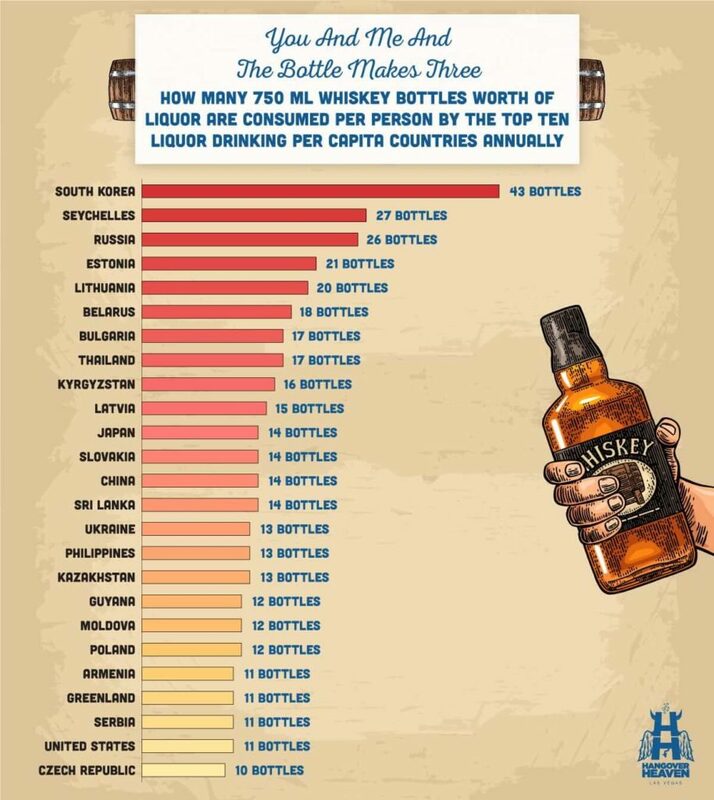 When looking at liquor consumption this way, we were able to see that the average person in South Korea consumes 43 whiskey bottles worth of liquor in a year, 16 full bottles more than the second-place nation. Of course, whiskey bottles aren’t the only way to evaluate how much liquor people drink. Taking shots is ingrained in cultures near and far, so it only made sense to convert the liquor consumption data into their 1.5 oz shot equivalents. We feel that the shots conversion is more eye-opening than the whiskey bottle comparison, and it reveals that South Koreans drink an average of 730 shots worth of liquor per year, which equals exactly two shots every single day! No matter where you’re from or what your alcoholic drink of choice is, one thing that is true for every human on Earth is that drinking too much in a night is bad for your body. That doesn’t stop people from doing it, however, and in those cases, the best bet for curing your hangover-related pain and misery lie in the IV hangover cures developed by the experts at Hangover Heaven!